The TruTrack Data Bloggers are a range of Data Loggers that transfer their data from the logger to the user using the GSM cell network and the internet rather than a computer and download cable. The logger communicates directly with a website that stores the data and the user can access the website at any time and use their web browser to view or download data. This system is platform independent so it can be used on any computer that has a web browser. The system can be Windows, Unix, Linux, Apple (OS X and IOS), Android or Google Chromium OS based. There is a "General" Data Blogger that can be fitted with a range of "Input Modules". For example you can get a mA Input Module that has 3 isolated 4 to 20mA inputs or an Environmental Input Module that has Temperature, Relative Humidity and Atmospheric Pressure sensors. In the future there will be a dedicated Water Height Blogger. The Data Blogger backs up its data to an SD memory card so that all data is saved locally as well as in the Web Servers Data Warehouse. If the Data Blogger can not make contact with it's web server it will also save up to 40 readings to internal memory and this data will be transmitted as soon as contact is re-established. Because all data is saved to SD card, the Data Blogger can be used as a regular Data Logger in areas that do not have GSM cell coverage. Data can be recovered by reading a .CSV file from the Bloggers SD card. This can be done in the field or the Bloggers SD card can be swapped for a blank SD card and the data recovered from the original SD card back at base. The Data Blogger can also send SMS text messages to the users cell phone if alarm conditions occur. The user can SMS text message the Data Blogger and request the current readings. 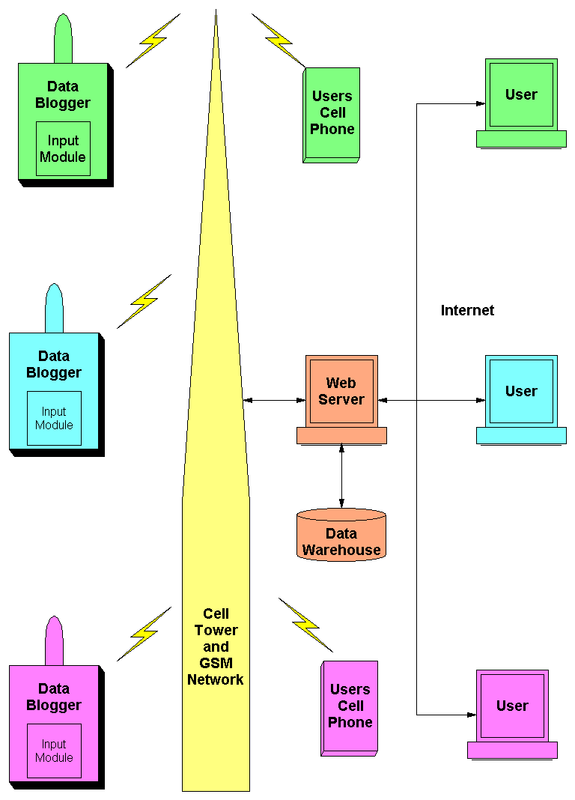 The blogger requires a GSM SIM card and data account from a GSM cell phone service provider. 1...A setup file can be put on an SD card and the card inserted in the blogger. The blogger will detect the file and ask the user if they want to use the new setup. The blogger has a LCD scren to show status and communicate with the user. 2...SMS text messages can be sent to the Data Blogger to change setup parameters. The Blogger has a rechargeable battery that will last about one month at 5 minute update intervals. The Blogger can be supplied with a Solar Cell or Plug Pack that can be used to continually charge the battery. This then gives a one month backup for the Solar Cell or Plug Pack. The blogger battery voltage is automatically logged so the user can see if the battery voltage is dropping. An alarm can also be set on battery voltage to warn the user if the voltage drops below 3.4 volts.